: “As the State Minister in charge of infrastructure in Japan, I have been impressed that there is still a great deal of scope for Japan to co-operate on building the infrastructure in your country. 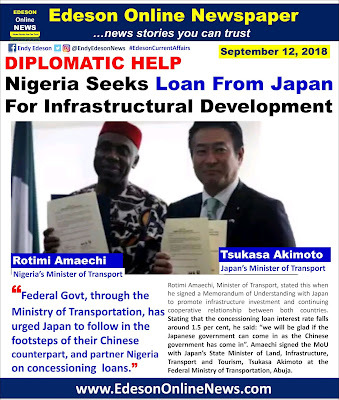 Nigeria don't need loan. They are only lying on our head just to get money for 2019 election and prepare for the worst if the election is not to their favour. God pass you Hon. Amechi & President Buhari. Aid wetin? The one they've been collecting thus far, what as it been aiding? In fact, according to World Bank statistical bulletin, Nigeria has been on a high debt rate. The debt is too much. Not China again but Japan this time. Are we not making money at all again in this country? Can't we do projects without loan?